While questions like "what is Aleppo?" or even "where is Aleppo?" may be easily answered, many other questions related to the Syrian civil war are significantly more difficult to answer. After more than five years of fighting, the conflict in Syria has become a complex tangle of insurgent groups, regime forces, and displaced peoples. With territories constantly changing hands, it's understandable if you could use a little refresher on the fundamentals of the Syrian crisis in order to better understand what's happening in Aleppo now. Earlier in December, forces loyal to Syrian President Bashar al-Assad ramped up their efforts to take back control of Aleppo's rebel-held eastern neighborhoods through air strikes, heavy shelling, and ground offensives. U.S. Secretary of State John Kerry has described the conflict in Syria as "the worst catastrophe since World War II." When asked about the situation in Aleppo, Kerry accused the Syrian government of carrying out "nothing short of a massacre" during a Dec. 15 press conference. As pro-government troops retake Aleppo in a major blow to rebel forces and aid organizations begin evacuating rebel-held territories in the city's eastern neighborhoods, here are 11 questions about Syria's civil war, explained. What's Happening In Aleppo Now? Rebel forces still in eastern Aleppo reportedly agreed to withdraw from the city in a ceasefire deal brokered by Russia and Turkey. Although evacuation efforts got off to a shaky start on Dec. 14 amid reports of renewed shelling, they resumed the following day with the International Committee of the Red Cross estimating late Dec. 15 that some 3,000 civilians and more than 40 wounded had been evacuated during the day. Evacuation efforts continued overnight with state-controlled news media and the Syrian Observatory for Human Rights both reporting that more than 8,000 people had been evacuated in total. Evacuations were halted again on Dec. 16 for reasons that were not immediately clear. World Health Organization officials told the New York Times their staff had been asked to leave the area where civilians were being loaded on to government buses for evacuation. Who Is Fighting For Control Of Aleppo? Rebel forces began fighting for control of Aleppo in 2012 in what was seen as their first major offensive. While they established a stronghold in the eastern part of the city, western Aleppo has largely remained under the regime's control. Rebels continued to retain control of key infrastructure points despite barrel bombings and alleged chemical attacks by forces loyal to President Assad. Over the last two months, pro-government forces have managed to regain control of many rebel-held areas in eastern Aleppo bit by bit through intense airstrikes. Are Those The Only Groups Involved In The Syrian War? To say that fighting in Syria is strictly between rebel factions and pro-government forces would be an oversimplification of a far more complex conflict. The New York Times, for example, describes the Syrian civil war "as four overlapping conflicts." The first is fighting between rebel groups (there are many different rebel factions) seeking to remove Assad from power and those loyal to the government. The second involves Syria's Kurdish minority, while the third pertains to the rise of the Islamic State in parts of Syria and Iraq. And while it's often said that the enemy of your enemy is your friend, that hasn't been the case in Syria. In some areas of the country, it's rebel forces or Kurdish groups fighting the Islamic State. In others, the Islamic State clashes with forces loyal to the Syrian government. The fourth and final conflict playing out in Syria, according to the Times, is that between the foreign powers intervening in the conflict. While Russia, Iran, and Lebanon's Hezbollah support Syria's president, the United States has supported "moderate" rebel groups, including the Syrian National Coalition. Saudi Arabia and Turkey also support opposition forces in Syria. Aleppo is one of the earth's oldest continuously inhabited cities and its historical center is classified as a UNESCO World Heritage Site. In fact, Aleppo's cultural and historical significance is part of what makes its reduction to rubble all the more painful. Moreover, the city was once one of Syria's most populous, serving as an economic hub before the war. Until recently, the eastern part of Aleppo was considered to be a key rebel stronghold. Its prominence as one of the biggest urban, rebel-held areas made it a significant battleground of the war. Some of the most harrowing and haunting images of the Syrian war have come from Aleppo, including that of a dazed and dusty 5-year-old, Omran Daqneesh. The recent fall of Aleppo to pro-government forces represents a major defeat for rebels, with some policy analysts suggesting the city's recapture would cement Assad's hold on Syria. But the city's recapture doesn't signal and end to the war. Are Civilians Still Left In Aleppo? While there are no definitive numbers regarding the number of civilians still in rebel-held areas of eastern Aleppo, NPR reports estimates are in the tens of thousands. As evacuation efforts broke down on Dec. 16, the New York Times reported the number of civilians still trapped in Aleppo's rebel-held east to be somewhere between 50,000 and 100,000. As the so-called Arab Spring saw the regimes of Tunisian President Zine El Abidine Ben Ali and Egyptian President Hosni Mubarak toppled, peaceful protests against Syrian President Bashar al-Assad sprouted up in Syria. 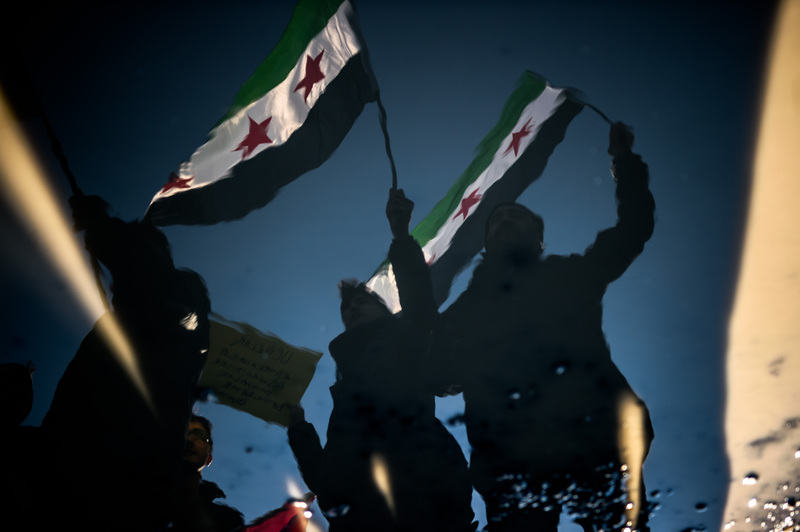 These protests were met with a violent crackdown by Assad, including the torture and murder of many civilians. Unsurprisingly, Assad's response spurred further unrest across the country until eventually protesters began to take up arms against him. Unfortunately, they are. In more than five years of fighting, civilians have been heavily affected by the war in Syria. The United Nations has accused pro-government forces of targeting medical facilities. From July to November, the aid organization Doctors Without Borders reportedly recorded 33 attacks on hospitals in Aleppo. According to NPR, the U.N. has said at least 370 civilians have been killed in Aleppo since September of this year. That number is similar to an estimate the White Helmets provided to the Washington Post. According to the White Helmets, at least 300 civilians in Aleppo have been killed and more than 820 others injured since Nov. 15. Earlier this week, the U.N. Human Rights Office said it had credible reports that pro-government forces had executed at least 82 civilians during its recent push to take back the city. Why, And How, Is Russia Involved? Throughout the war, Russia has remained President Assad's best ally. This is likely due, at least in part, to the fact that Russia has a key naval base in Syria. In 2015, however, Russia moved from supporting Assad politically to conducting a military intervention on his behalf. Intense Russian airstrikes have enabled Assad to make significant gains against rebel forces. While death toll estimates vary from organization to organization, the United Nations and Arab League Envoy to Syria recently estimated that 400,000 people had been killed as a result of the war. Millions more have been displaced, with the UNHCR reporting some 4.8 million Syrians have fled the country while another 6.3 million people have been displaced internally due to conflict. The United States supports what they call "moderate" rebel groups, supplying them with limited weaponry and aid from intelligence agencies. However, as the war has progressed and given rise to extremists like the Islamic State, the United States' predominant focus has shifted to curbing the advancement of these radical groups. The United States continues to conduct airstrikes on the Islamic State and has been hesitant to supply even moderate rebel factions with anti-aircraft weapons (used to defend against airstrikes) for fear they may be captured by more extremist groups. Although the United States has attempted to secure peace in Syria through negotiations with Russia, those talks have all since collapsed. According to Kerry, the United States has, as of Dec. 15, provided more than $6 billion worth of humanitarian aid to Syria and Syrian refugees since the start of the war. The images currently coming out of Aleppo show destruction so widespread that it's easy to feel helpless. However, now may be one of the most important times to help those affected by the conflict in Syria. Although it's unclear if or when evacuation efforts will resume in eastern Aleppo, organizations working to aid those fleeing the city need more help than ever. Consider donating to charities working to help those inside Syria, such as the International Committee of the Red Cross, the White Helmets, Doctors Without Borders, the International Rescue Committee, Preemptive Love Coalition, Hand in Hand for Syria, Save the Children, or Syria Relief. Yet charitable donations aren't the only way to help. Consider reaching out to politicians and government representatives to ensure that ending the war and supporting humanitarian aid efforts in Syria remain on their list of priorities. The war in Syria is said to be the deadliest conflict of the 21st century and has sparked what U.N. High Commissioner for Refugees António Guterres has called "the biggest humanitarian emergency of our era." While it's impossible to say when or how the war might end, awareness of how the conflict is affecting Syrians, inside and outside of the country, remains as vital as ever.